Non-native weeds can invade anywhere. Neighborhoods. Meadows. Wilderness. In fact, there are over 2,800 infestations of nearly 60 non-native invasive plant species in the Truckee River watershed. We’re attacking over 2,000 acres of infestation in several ways. We collaborate on major weed removal efforts with the US Forest Service and California Department of Fish and Wildlife. Additionally, we run programs involving local citizens, landowners, land managers and public agencies. The war on invasive species is complex. First we identify the enemy (and it’s tricky.) Then we attack—but different weeds require different tactics. Learn to differentiate imposters from their native look-a-likes. Visit up to 10 sites, including on-going eradication projects and sites ready for investigation. Acquire the information, guidance and materials to help identify, treat and report weeds back in your own neighborhood. Participate in hands-on, group eradication of specific infestations under the leadership of a trained botanist. Learn identification and removal techniques as well as critical disposal methods. If not done properly, simply pulling unwanted plants can actually stimulate invasion. Noticed a suspicious infestation in your neighborhood—or on your favorite hike? We urge you to report your findings. Not sure who’s a native…? And who’s an imposter…? Whenever you track down invasive weeds, don’t keep it to yourself. Help us win the battle by contacting our “Early Detection, Rapid Response” specialist. And include a photo if you have one. 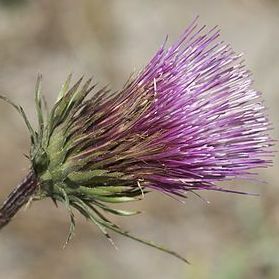 Above: a native Anderson Thistle. Below: an invasive Bull Thistle. Left: a native Anderson Thistle. Right: an invasive Bull Thistle.